Longtime snow rangers hanging up their badges! CONWAY — It’s a ritual: Every spring, thousands of skiers flock to the Tuckerman Ravine, the iconic eastern bowl of Mount Washington. They march up in sneakers, skis and boots strapped to backpacks, sweating their way out of Pinkham Notch, up past the Hermit Lake shelters and the Little Headwall to the treeline, where a great wall of snow rears across the landscape. The Bowl. The Ravine. Tucks. Skiers have lots of names for Tuckerman Ravine, but no matter what you call it, the pilgrimage is the same. It is a chance to match skills with the mountain, to see if you have what it takes to drop the Lip, thread the Chute or last the whole of Left Gully. Or it’s a chance to watch the spectacle, to join in the fun vicariously as daredevils drop ice cliffs. It’s a rite of eastern skiing, and on any given spring weekend, thousands will make the journey in search of snow. For the past quarter-century, this annual pilgrimage has been overseen by one man: Chris Joosen, the U.S. Forest Service’s lead snow ranger and head of the Mount Washington Avalanche Center. But now, after more than two decades of shepherding skiers, climbers and winter hikers up the flanks of Mount Washington, Joosen is leaving. The Mount Washington Avalanche Center is the only avalanche center in the U.S. east of the Rockies, and it is the oldest forecasting program in the country. 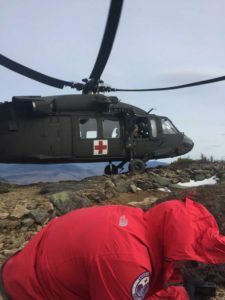 Each winter morning, a team of snow rangers looks at the snow and weather conditions in Tuckerman and Huntington Ravine and post an avalanche hazard for the day, ranging from low to extreme. Many skiers and climbers follow the upticks and changes in the forecast religiously. They pull snow rangers aside when they can to ask advice about their intended route or about their impressions of the weather. Few people spend as much time on Mount Washington, and almost no one spends as much time in Tucks. Joosen, for his part, has been there since the Bush presidency. The first Bush. “It’s bittersweet, ” he said, but “I look forward to a change.” Tuckerman Ravine has been such a huge part of his life, he said, but after years on the side of Mount Washington he’s ready for a new challenge. His wife, who also works for the U.S. Forest Service, was offered a job in Oregon, and she took it. Joosen will finish out the 2015/2016 winter season and then head west. It will be a time of transition for the Mount Washington Avalanche Center. Joosen is only the third lead snow ranger in the organization’s more than 60-year existence. If that isn’t a big enough loss, the next-longest-serving snow ranger, Jeff Lane, also is leaving. Lane has been a snow ranger for 10 years. Before that, he was AMC caretaker at the Hermit Lake shelters. Now Lane, who is married and lives in Conway, is planning to stay home to care for his and wife Erin’s two young children. Between Joosen and Lane, four decades of experience will leave the mountain this spring. Lane said what he will miss about the job is the one-on-one interactions with skiers and climbers, the conversations that keep people out of harm’s way. And human involvement in slides is on the rise, according to Joosen. More and more backcountry enthusiasts are heading into Tuckerman Ravine and the surrounding areas earlier and earlier, before warm spring temperatures can help the snow stabilize. That increase coincides with an increase in the number of people getting educated about avalanche risks, he said. “We have made dramatic improvements in mountain culture in the Northeast, ” but he cautions that can lead to overconfidence. “We’re the nervous nellies, ” he said. Snow rangers are there to let people know the risks and to respond if something happens. And they know a lot. Snow rangers are up in Tuckerman for six months of the year. They watch the weather, they traverse the slopes. If there is a risk, an instability, they find it. And being up there every day for decades, they have seen changes. This winter, in particular, Lane said, looked like it never really happened. The snow in the woods is low, too, he said, at a time of year often historically the snowiest. Right now the mountain is a strange mix of early season conditions with spring weather. Other changes have been in the way people use the mountain. In addition to more users visiting earlier, Joosen said, fewer skiers are hiking with their skis on their back. The growth of alpine touring equipment, which allows skiers to release the heel of the binding so they can ski uphill, has changed how people get to Tucks. Many now ski up from Pinkham Notch rather than hike. With improved forecasting, Lane said, more people are making day trips to Tuckerman Ravine. In the past, he said, when he was the Hermit Lake Caretaker, the weekends were always booked solid. But today “people are more willing to do day trips based on the ability to come when it’s good, ” he said. 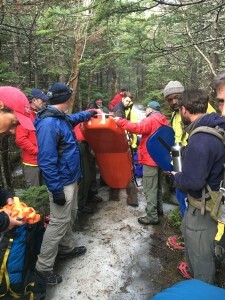 Luckily, Joosen said, the Mount Washington Avalanche Center is supported by volunteer groups like the Mount Washington Volunteer Ski Patrol, Friends of the Mount Washington Avalanche Center and Mountain Rescue Service, who help raise money and provide additional manpower to keep Tucks safe. But after this winter, Joosen won’t be doing it at all. What he’ll miss most, he said, is “the occasional private time that I have in the terrain, ” those moments above treeline when the clouds are low and the wind is quiet. “The mountain has a personality, ” he said, and that’s what he’ll miss. Those who make the spring pilgrimage, however, and those who have grown accustomed to seeing Joosen’s face on the hill for the past 26 years will miss more than that. Enter your email address to subscribe to AVSARNH and receive notifications of new posts by email.